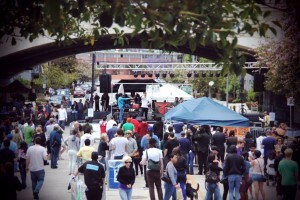 Until and unless we get the Sunset Junction Street Festival back, The Silver Lake Jubilee is it, when it comes to Silver Lake music street fairs. Festivities start at noon at the intersection of Sunset and Santa Monica Boulevards and go till 11pm. The fun continues on Sunday from noon until 10pm. You can buy tickets for individual days or pick up a weekend pass if you plan to immerse yourself in this Silver Lake music event. Radio station KCRW brings us the Silver Lake Jubilee which includes tons of live music, food trucks, comedians, craft vendors and more. Proceeds from the event support Los Angeles Arts & Athletics Alliance. The festival is working to be as green as possible by offering free parking areas, free water for those who supply their own reusable bottles and waste bins for recycling and compost. If cycling is not an option, parking is provided at 4400 W Sunset Blvd for $10 and free shuttles will take festival goers to and from the entrance at Santa Monica and Commonwealth from noon to midnight daily. If you are parking elsewhere or have someone dropping you off, you can also enter at 4000 Santa Monica Blvd. or 4212 Sunset Blvd .